iLuv iMM747 review | What Hi-Fi? First it was the iPod, then it was the iPhone, and now it's the iPad that all manufacturers of Apple peripherals will be trying to bring to their particular party. American company iLuv is one of the first out of the blocks, with the iMM747 making room on its dock for the new 10in-tall must-have on everyone's wishlist. But don't be perturbed if you're still more than happy with your iPhone or iPod of choice – this is fully compatible with all those, too. And dare we suggest more compatible? If you've got the cash for an iPad, might you not spend a touch more than £100 on a dock? That said, this is a well-specifed, thanks to the inclusion of a USB connection that lets you connect to your PC or Mac and update your iPod's library while it's docked. A neat feature. There's an auxiliary input for non-Apple portables, too. 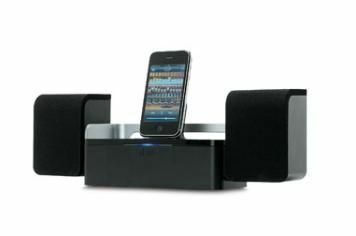 Build quality leaves a little to be desired – the unit feels flimsy and lightweight – while the dock itself seems overly fussy in making you push back the support on which your iPod rests in order to easily access the dock. Still, it certainly works well with our iPad and looks rather smart when almost overwhelmed by the tablet. Sonically, it's no great shakes. Acoustic music, such as Adele's delicate but dynamic Hometown Glory, sounds reasonably detailed with attention to subtleties but drive it a little harder – try Kings Of Leon – and it struggles and sounds strained. It won't fill a room like others can, and if you like bottom-end grunt and power, this probably isn't for you. At £100 and with good support and features, we can't be too harsh but we know there's better sound and build quality out there.